As a teenager, Steven Roberts was living on the streets alongside drug addicts and older homeless men. 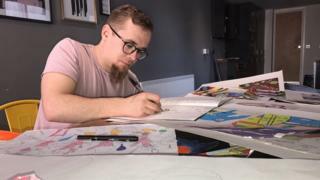 He was kicked out of his family home when he was 19 as he struggled to cope with attention deficit hyperactivity disorder (ADHD). But with a love of drawing, he used that "slap" to enrol in an art degree at Cardiff Metropolitan University. Now he is preparing to show his work at the YMCA hostel in Port Talbot where he lived while he was homeless. Mr Roberts, now 22, first found himself living on the streets after a row with his parents at their home in Ystalyfera, near Swansea. "Suddenly I found myself surrounded by people who didn't have much of anything," he said. "It was a real slap, like a baby being born, but some people need that." He admitted he was forced to "find the best version" of himself to survive in this "primal place". But Mr Roberts used his difficult experiences as inspiration for his art. "He got some structure back into his life and took advantage of what was on offer," explained YMCA Port Talbot hostel manager Andy Philpin. "That, for me, is what made the difference." Mr Roberts wanted to get out of the hostel and go back to school, but he said being on housing benefit made it more difficult to get university funding. Without the help of the Caer Las advocacy charity, Mr Roberts said it may not have been able to happen. His advice to people who find themselves in a similar situation? He said it is to "find something that gives you purpose and meaning". For him, this was art and "making something and turning the pain into something that can be regarded as positive". Mr Roberts was invited back to exhibit his work in the hostel in the hope that it will inspire the men living there now, explained Andy Brown, YMCA Port Talbot's chief executive officer. "Hostels can be seen as a bad place," the 52-year-old said. "For us it's about getting a roof over people's heads and food in their bellies. Only then can they get in the right place try to reach their goals."